The DFW-Arlington metro area is leading the nation in population growth, according to the latest U.S. Census Bureau population estimates. With a 146,000 increase in population just last year, Dallas-Fort Worth-Arlington has seen the largest growth in the entire United States. Most of the other large metro areas reported on by the U.S. Census Bureau see their increases originate from international migration and natural growth (birth over death rates). The DFW-Arlington metro area is unique in that, “historically, the Dallas metro area attracts large numbers from both international and domestic migration,” says Molly Cromwell, a U.S. Census Bureau demographer. So, while comparable metro areas see influx due to only two drivers, DFW-Arlington has a long history of experiencing growth from all three key drivers; natural growth, as well as international and domestic migration. Indeed, the population growth of the entire state of Texas is proving exceptional. The population of Texas has grown by over 5 million in the last decade. And, in the coming years Texas will see sustained growth, according to the Dallas Fed Chief, Robert Kaplan, president of the Federal Reserve Bank of Dallas. “Texas is extremely well positioned,” Kaplan says. “At a time where most of the country is challenged by aging populations, slowing workforce growth and a loss of working age population, with the population growth, Texas is bucking a lot of those trends.” Over the next 25 years, the population is Texas is anticipated to increase to more than 40 million. Of course, population growth plays an integral role in economic health. It’s people who drive the economy. People provide the workforce that larger companies need, and they are the consumers who keep the economy strong by purchasing goods and services. Population expansion is not only a driver of economic health, but a key indicator. People go where the jobs are. In the DFW metro area, where Fortune 500 companies are moving in droves, those new jobs are attracting highly skilled workers. Because of the robust employment growth in DFW and Texas, the Federal Reserve Bank of Dallas is predicting that the state’s economy could increase by a minimum of 4 percent by the end of 2018, over 1 and a half percent higher than the estimated economic growth for the U.S. The corporate expansion into DFW and Texas in general shows no sign of stopping, either. Large, medium and small companies are realizing that DFW is where their future lies. TreeHouse, the established environmentally-conscious home improvement store, is also recognizing that Dallas is where the future lies. They announced plans to close their Austin store and focus solely on their new and successful Dallas location. “We’re a little bigger and smarter now…DFW offers the most opportunity for TreeHouse to grow its market share,” says Chairman and CEO Gary Kusin. The Sanders Trust, a giant healthcare real estate investment company and owners of three rehabilitation hospitals in Austin, Dallas and Houston, has now opened a new office in Dallas, where it will emphasize corporate development, partnerships and acquisitions. “With the…opening of our Dallas, Texas office, we continue to focus on our…growth in the Southwest and Texas,” said President and CEO, Rance Sanders. 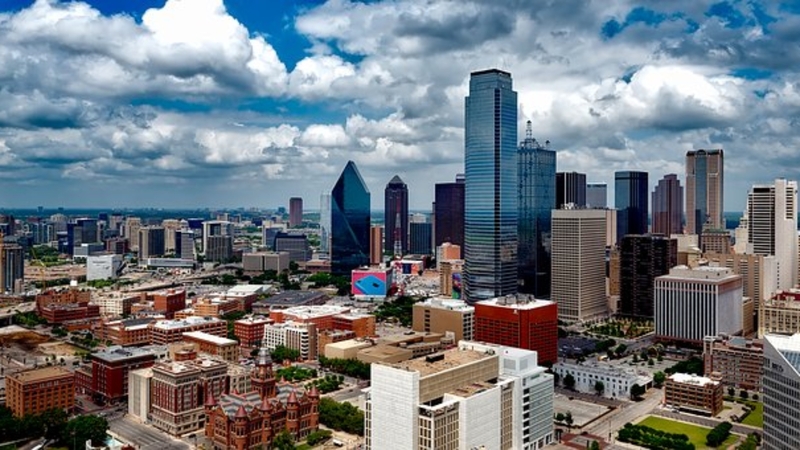 Nearly 100,000 new jobs were created in DFW over the last year, according to a Bureau of Labor Statistics report issued in February of 2018. In terms of non-farm employment, Dallas led the pack at 2.8% in job gains, beating out such metropolitan areas as Boston, Atlanta, Miami, New York, and Phoenix. Many of those jobs are in the higher paying fields of professional business services. With the DFW-Arlington metro population growing at unprecedented rates, and job growth matching the acceleration, it’s clear that the sky’s the limit for many years to come. As companies across the nation are rushing to get their foot in the door or cement their presence in DFW, there’s never been a more positive outlook for North Texas.